As the role of routine computerized health data in epidemiological research is growing,1 there is a need to examine their strengths and limitations.2,3 Typical shortcomings of such data include limited linkage possibilities, incomplete temporal or geographic coverage, restriction to selected patient groups, and lack of systematic follow-up.4–7 Among the examples, the Dutch nationwide hospital registry has been in operation since 1963, but personal records are anonymized, and therefore not linkable to other data sources.4 Also, the United Kingdom’s Clinical Practice Research Datalink has recorded detailed information on both diagnoses and prescriptions in primary care since 1987 but covers only part of the population and lacks information on patients who leave participating practices.8 In the United States, the collection of routine health data is restricted to specific age groups (eg, Medicare beneficiaries),6 income groups (eg, Medicaid beneficiaries),6 professions (eg, the Veterans Affairs),7 or members of private insurance plans (eg, Kaiser Permanente),9 often without the possibility of linkage or long-term follow-up. The Danish National Patient Registry (DNPR) is one such population-based administrative registry, which has collected data from all Danish hospitals since 1977 with complete nationwide coverage since 1978.17–19 An epidemiologist setting out to use the DNPR must be familiar with the strengths and limitations of its data. Many studies have validated algorithms for identifying health events in the DNPR, but the reports are fragmented and no overview exists. Herein, we review the content and data quality of the DNPR and its potential as a research tool in epidemiology. Denmark had 5,580,516 inhabitants in 2012, excluding inhabitants of Greenland and the Faroe Islands.20 Although these areas are part of the Kingdom of Denmark, they are not covered by the DNPR. Since 2007, the Danish healthcare system has had three administrative levels:10,21 1) the state, responsible for legislation, national guidelines, surveillance, and health financing through the Ministry of Health; 2) the regions (n=5), responsible for delivery of primary and hospital-based care; and 3) the municipalities (n=98), responsible for a broad range of welfare services, including school health, child dental treatment, home care, primary disease prevention, and rehabilitation. Since its establishment, different names have been used in the literature for the DNPR. Commonly used English terms include the Danish National Hospital Register,18 Danish National Health Registry,19 Danish National Patient Register,17 Danish Hospital Discharge Registry,25 and Danish National Registry of Patients.1 The official English name, as it appears in the registry declaration by the Danish Health and Medicines Authority, is the Danish National Patient Registry, DNPR. This term therefore will be used in this review. Abbreviations: CPR, Civil Personal Register; TNM, Classification of malignant tumours based on tumor size (T), lymph node involvement (N) and distant metastasis (M). Administrative data include personal and admission data. The personal data include patients’ CPR numbers and municipality and region of residence. The admission data include hospital and department codes, admission type (acute or nonacute), patient contact type (inpatient, outpatient, or emergency department [ED]), referral information, contact reason, and dates of admission and discharge. Treatments include information on surgery, other treatments (eg, invasive procedures, mechanical ventilation, dialysis, cancer treatments, and psychotherapy), anesthesia, and intensive care (Table 2). Examinations include radiological procedures and other examinations (Table 2). The attending physician/surgeon registers treatment and examination codes immediately following their completion. Thus, each treatment and examination is assigned to its own exact date, independent of the dates of admission and discharge. 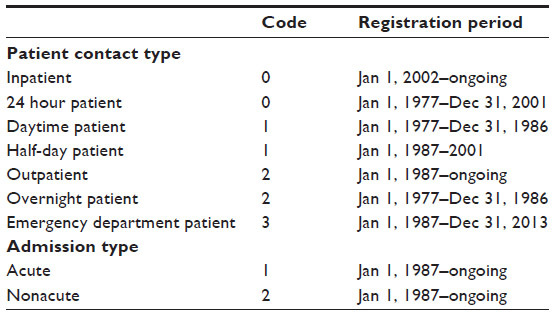 For the admission data, the first change occurred in 1987, whereby registration of patient contacts, referral information, and type of discharge was simplified (Table 3). Changes have been made almost annually thereafter, gradually expanding the registry’s content as shown in Figure 1. The most recent changes to the admission data concerned type of admission and patient contact (Table 3). As of January 1, 2014, ED patients are no longer registered separately as “patient contact type 3” but instead as acute outpatients (ie, “admission type 1” and “patient contact type 2”), whereas other outpatients are registered as nonacute outpatients (ie, “admission type 2” and patient contact type 2). Thus, a patient contact in the DNPR was defined as an inpatient contact from 1977 through 1994; an inpatient, outpatient, or ED contact from 1995 through 2013; and as an inpatient or outpatient contact thereafter. 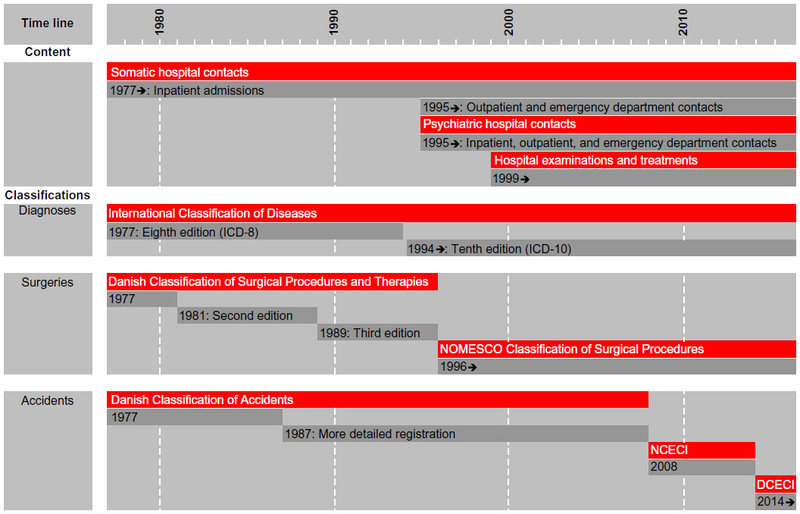 Figure 1 Timeline for the content and classification systems in the Danish National Patient Registry. Abbreviations: DCECI, Danish Classification of External Causes of Injury; ed, edition; ICD, International Classification of Diseases; NCECI, Nordic Classification of External Causes of Injury; NOMESCO, Nordic Medico-Statistical Committee. For diagnoses, it was originally possible to register up to 19 secondary diagnoses (ie, a maximum of 20 diagnoses per contact). Since 1995, the maximum number of recordable secondary diagnoses has increased to 99 in 1995–1998, 999 in 1999–2002, and 9,999 thereafter. Although in practice this means that there is no upper limit to the number of recordable secondary diagnoses, only the first 18 secondary diagnoses are subject to reimbursement by the Danish National Health Service.42 Since the adaption of the tenth revision of the International Classification of Diseases (ICD-10) in 1994, 23% of hospital contacts have had one or more secondary diagnoses recorded. The median number of secondary diagnoses per contact in this period was 1 (interquartile range: 1–2 diagnoses). Surgeries have been reported to the DNPR since 1977. Starting in 1999, diagnostic examinations and treatments were included.26,35 It became mandatory to report on many medical treatments in 2001 (including cardiac, respiratory, kidney, and cancer treatments) and on radiological examinations in 2002. The results of examinations are not included in the DNPR (Table 2). Thus, the DNPR records when a patient undergoes magnetic resonance imaging, colonoscopy, biopsy, etc, but the findings are not registered explicitly. In some cases, however, findings may implicitly be inferred from the recorded diagnoses (eg, when an ulcer diagnosis follows procedure coding for gastroscopy). During 1977–2012, the cumulative Danish population numbered 8,342,199 persons. During this period, 8,085,603 distinct persons were registered in the DNPR at least once. Among these, 7,268,857 (90%) persons were registered with an inpatient contact, 5,953,405 (74%) persons with an outpatient contact, and 5,097,300 (63%) persons with an ED contact. When excluding the unspecific Z-codes (factors influencing health status and contact with health services), the numbers of persons registered with inpatient, outpatient, and ED contacts were 4,610,123, 4,995,365, and 4,792,298, respectively. The distribution of all hospital contacts according to ICD category and patient contact type is shown in Table 4. 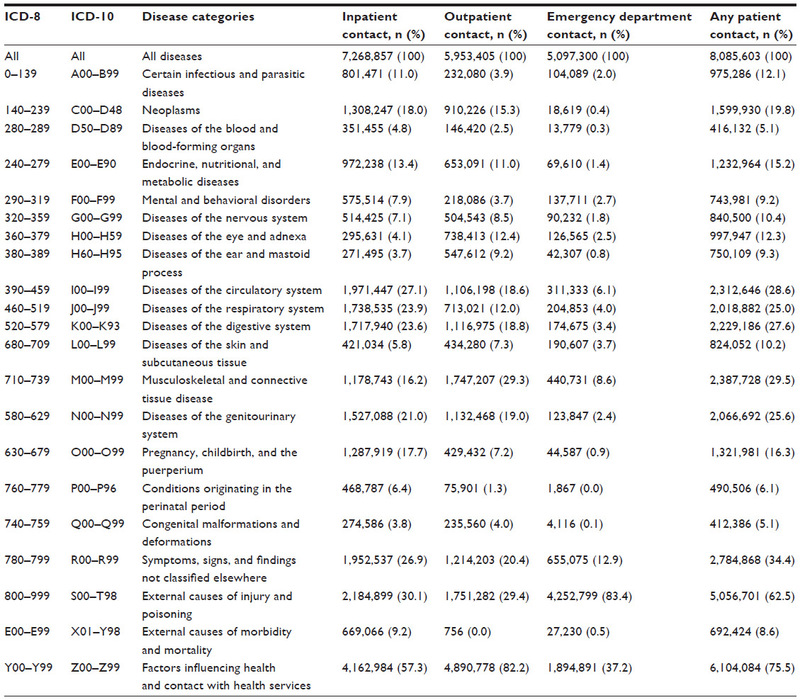 The 25 most common ICD-10 diagnoses for each patient contact type are provided in Table 5. Notes: aThe disease categories are ordered according to the ICD-10. Both primary and secondary diagnoses were included. A person (ie, one Civil Personal Register number) can contribute in several diseases categories, but only once in each cell. Abbreviation: ICD, International Classification of Diseases. Notes: aBoth primary and secondary diagnoses are included. Factors influencing health status and contact with health services (Z-codes) are not included. Abbreviation: ICD, International Classification of Diseases; COPD, chronic obstructive pulmonary disease. 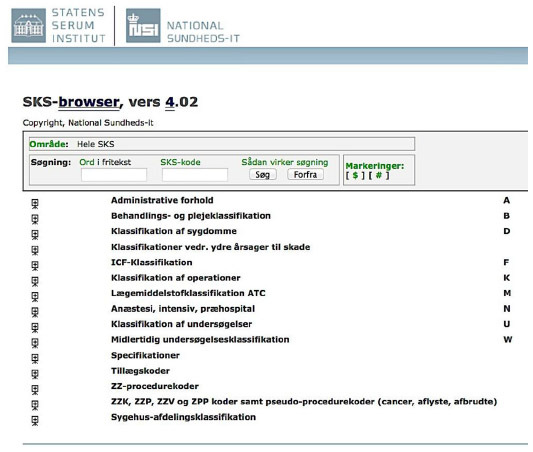 Figure 2 User interface of the Danish Health Care Classification System (SKS browser). Notes: Available at http://www.medinfo.dk/sks/brows.php. English translation (consecutive line order): administrative data/classifications of treatment and care/classification of diseases/classifications of external causes of injury/International Classification of Functioning (ICF)/classification of surgery/Anatomical Therapeutic Chemical (ATC) classification system/anesthesia, intensive care, prehospital care/classification of examinations/temporary classification of examinations/specifications/supplementary codes/ZZ-procedure codes/ZZK, ZZP, ZZV, and ZPP codes and pseudo procedure codes (cancer, cancelled, discontinued)/classification of hospitals and departments. Abbreviation: SKS, Sundhedsvæsenets Klassifikations System. Accidents have been coded using the Danish Classification of Accidents. A detailed registration was introduced in 1987. The latest version of the classification, the Nordic Classification of External Causes of Injury, also included suicide attempts and violence.26 It was adopted in 2008 and used until a new Danish Classification of External Causes of Injury was incorporated in the SKS, in 2014.36,37 Although closely related to the Nordic classification in structure, the new Danish classification facilitates a simpler registration of external causes of injury. In-hospital medication use (without dispensed dose or route of administration) is registered using different modules consistent with the Anatomical Therapeutic Chemical (ATC) classification system. Data on in-hospital medical treatment are not commonly used in research, except for drugs exclusively administered at hospitals, eg, fibrinolysis or cancer/immune-modulating treatments such as antibody, radiation, cytostatic, and biological therapies (Table 2). These drugs are primarily registered with a SKS treatment code, but their ATC codes can also be used as supplemental codes (eg, fibrinolysis is covered by SKS code BOHA1 and ATC code B01AD). The two most common measures of data quality are validity and completeness.49 By validity we refer to the extent to which a variable measures the intended construct.49 The positive predictive value (PPV) of registration is the most frequently reported measure of the validity of records in the DNPR. It is defined as the proportion of patients registered with a disease who truly have the disease and is usually estimated using medical record review as the reference standard to confirm the presence of disease.49 The term reference standard is used here, as medical record is not always considered the gold standard in validation studies, although one must assume that it is a better representation of the truth than the registry record. Completeness refers to the proportion of true cases of a disease that is correctly captured by the registry.49 Completeness can be measured in relation to either all individuals in the general population with a specific disease or all patients admitted/treated for the specific disease. Completeness is largely determined by the registry’s sensitivity and depends on the amount of missing data.49 Since no complete reference source exists, it is difficult to estimate the overall completeness of registry data relative to the general population. Data completeness depends on hospitalization patterns and diagnostic accuracy. Thus, conditions such as nonfatal myocardial infarction or hip fracture, which should always lead to a hospital encounter, are registered consistently in the DNPR. In contrast, lifestyle risk factors (overweight, smoking, excessive alcohol consumption, and physical inactivity) and conditions as hypertension or uncomplicated diabetes are often treated by GPs and are thus not completely registered. The data quality of individual variables in the DNPR has been examined on an ad hoc basis.25,52–164 To provide researchers with an overview of such studies, we performed a systematic review, aiming to create a bibliography of validated administrative data, diagnoses, treatments, and examinations in the DNPR. Figure S1 shows a flowchart for the review process, including the search strategy. We searched MEDLINE (PubMed) and the Danish Medical Journal (http://ugeskriftet.dk/udgivelser) using the Danish and the various English names for the DNPR. One author (MS) screened titles and abstracts, and when necessary the full-text papers, for inclusion in the bibliography. Because validation is often a secondary study aim and therefore not highlighted in titles, abstracts, or keywords of papers, even a comprehensive systematic search cannot identify all relevant papers. We therefore also searched the reference lists of the retrieved papers for potentially relevant articles. Finally, we included additional studies known to us beforehand. We included all studies written in English or Danish, regardless of characteristics, such as publication status or year. Two authors (MS and SAJS) independently extracted the following data from all included papers: patient contact type (inpatient, outpatient, or ED), diagnosis type (primary vs secondary), codes/algorithms used, measure of validity (PPV/negative predictive value), measure of completeness (sensitivity/specificity), the reference standard used, and results (absolute numbers, proportions, and confidence intervals [CIs]). Any disagreements were resolved by consensus. When patient contact, diagnosis type, or codes were not specified, we contacted the corresponding authors for this information. Unspecified patient type included most often both in- and outpatient diagnoses. Unspecified diagnosis type included most often both primary and secondary diagnoses. Unconfirmed data were categorized as not available (n/a). We used extracted information as well as more detailed information from selected studies to illustrate the use of various algorithms over time and to discuss methodological considerations, in particular information bias. Our review showed that several different methods had been used to calculate CIs for proportions. Moreover, studies varied with respect to the number of decimal points reported for CIs, while some studies failed to report CIs. To permit direct comparisons among study results, we recalculated all proportions based on the absolute numbers provided in the papers. We used Wilson’s score methods to calculate CIs with one decimal point precision.165 When lack of absolute numbers precluded recalculations, we presented the results as reported in the original reference. We identified 114 papers, validating 1–40 codes/algorithms each and 253 in total. The bibliography of validated variables is provided in Table S1. The variables are listed in the table according to the SKS coding (ie, ICD-10 codes for diagnoses and Nordic Medico-Statistical Committee codes for surgeries) and within each variable according to study period. Recalculation of all proportions reported was possible for 89% (102/114) of all studies. We found that the PPVs of the reported diagnoses in the DNPR ranged from below 15%137 to 100%.58,97 Some of this variation (both intervariable and intravariable variation) may result from different reference standards used. The majority of variables were examined in cross-sectional studies using medical record review as the reference standard. However, several other reference standards have also been used, including patient interviews,84,146 clinical registries,32,57,78,89,142 the Danish Cancer Registry,59,60,64,67 a military conscription research database,116 the Clinical Laboratory Information System Database,72,73,114 the Danish National Pathology Registry and Data Bank,120 the hospital pharmacy systems,160 the Danish prescription registries,79,83 GP verification,75 radiology reports,111,118 and autopsy reports.110,141 Our review revealed variation in study settings and calendar year. The study setting is important to consider, as the PPV depends on the prevalence of disease and therefore on the data’s department of origin. Thus, restriction to specialized departments, eg, rheumatology departments when examining the validity of a rheumatoid arthritis diagnosis, likely results in higher PPVs.126 Similarly, the calendar year may affect the quality of variables, given the continuous improvement in diagnostic criteria and procedures used. As examples, the validation studies indicate a temporal increase in the PPV of ulcer disease (from 84% during 1997–2001119 to 98% during 1998–200758) and of myocardial infarction (from 92% during 1979–1980,100 94% during 1982–1991,99 to almost 100% during 1996–200997). Improvements in variable completeness over time have also been documented for, eg, bacteremia (from 4.4% in 1994,25 25.1% in 2000,55 to 35.1% in 201155). The large variation in data validity found in our review underscores the need to validate diagnoses and treatments before using DNPR data for research. Furthermore, validation studies may need updates, as newer diagnostic criteria and procedures may differ from those used in older validation studies. Abbreviation: DNPR, Danish National Patient Registry. Using techniques similar to that in risk studies, the DNPR can be used to study outcomes in well-defined patient groups (eg, diagnostic examinations,182 recurrence,112 and complications183) and prognostic factors.170 These patient groups may be identified from the DNPR itself, other registries, or surveys. Most recently, the DNPR has also been used to gather long-term follow-up data for randomized controlled trials using clinically driven outcome detection.184 The automated event-detection feature of the DNPR allows for large, low-cost randomized trials that reflect daily clinical practice, cover a broad range of patients and end points, and include lifelong follow-up.183,185–187 As with cohort studies, DNPR data may be used to identify exposures and cases/outcomes in case–control studies112,188,189 and ecological studies182 (Table 7). The availability of patient-identifiable data in the DNPR makes it technically easy to link to other Danish data sources using the CPR number.20 Because Denmark’s registries are numerous and far reaching even by the high standards of the Nordic countries,22,191 additional information on, eg, cancer staging,34 laboratory test results,167 general practice utilization,192 socioeconomic data,193–196 prescription use,197 all-cause mortality,20 and cause-specific mortality198 can easily be obtained to supplement the DNPR. Figure 3 shows the time line for the DNPR relative to selected administrative and clinical registries in Denmark, illustrating the potential for record linkage by calendar year. As shown, nationwide data can be obtained on, eg, all twins in Denmark since 1870 (the Danish Twin Registry),199 specific causes of death since 1943 (the Danish Register of Causes of Death),198 detailed cancer diagnoses since 1943 (the Danish Cancer Registry),34 migration and vital status since 1968 (the Danish Civil Registration System),20 personal income since 1970 (the Income Statistics Registry),195 labor market statistics and health services since 1980 (the Integrated Database for Labour Market Research193 and Danish National Health Service Register),192 education since 1981 (the Population’s Education Register),194 prescribed medications since 1995 (the Danish National Prescription Registry),168 and patient tissue samples and blood transfusions since 1997 (the Danish National Pathology Registry and Blood Transfusion Databases).166 The Danish clinical registries constitute the infrastructure of the National Clinical Quality Databases and the Danish Multidisciplinary Cancer Groups.200 The clinical registries contain information about individual patients used for quality improvement, research, and surveillance purposes.200 Linkage to one or more of the current 69 clinical registries thus provides detailed information on a range of procedures (eg, hip arthroplasty and hysterectomy) and diseases (eg, heart failure, stroke, diabetes, and various malignant diseases; Figure 3).200,201 Finally, individual-level linkage to data from randomized controlled trials, population surveys, and epidemiologic field studies is possible as previously described. Figure 3 Timeline for the initiation of selected Danish registries linkable to the Danish National Patient Registry. Abbreviations: ADHD, attention deficit hyperactivity disorder; ICD, International Classification of Diseases; GP, general practitioner; COPD, chronic obstructive pulmonary disease. Methodological considerations related to the internal validity of cohort studies conducted within the DNPR are summarized subsequently and in Table 8. We also address the special methodological problems that relate to studies of temporal health trends. Appropriate population-based study designs can reduce selection biases in cohort studies for three reasons. First, the Danish population has a relatively stable and homogeneous demography with regard to race and religion. Second, the universal health care system (and small private hospital sector)40 prevents selection bias arising from selective inclusion of specific hospitals, health insurance systems, income levels, or age groups. Third, virtually complete follow-up of all patients (with no unrecorded dropouts) is possible because the Danish Civil Registration System records vital status and migrations on a daily basis.20 Still, the cohort represented in the DNPR is only unselected for diseases that always require hospital treatment. For diseases that can be treated in general practice, cases included in the DNPR to some degree represent a selected patient group, with either high severity of the disease in question (eg, herpes zoster infections, obesity, diabetes, and hypertension) or severe comorbidity leading to a lower threshold for hospital admission compared with patients without comorbidity (eg, pneumonia in transplant patients vs in young otherwise healthy adults). Before engaging in extensive retrieval and analysis of data, it is therefore important to consult clinicians from the relevant specialty to learn about current and previous coding practices. As an example, atrial fibrillation and atrial flutter have separate codes at the four-digit level. However, a large proportion of all diagnoses for atrial fibrillation or flutter are registered as “not elsewhere specified” (Danish, uden nærmere specifikation). Since ~95% of all I48 codes correspond to atrial fibrillation and only 5% to atrial flutter,104 use of the unspecified code will increase the sensitivity of the DNPR-based definition of atrial fibrillation but reduce its specificity. Hence, DNPR studies on risk of atrial fibrillation are often limited by considering atrial fibrillation and flutter as one disease entity.174 Another example is ICD-10 diagnoses of stroke (I60–I64). Approximately one-third of the cases are registered as unspecified stroke (I64),204 and among these, two-thirds are ischemic strokes.91 Inclusion of unspecified diagnoses will increase sensitivity but reduce specificity of stroke subtypes. The introduction of the Diagnosis-Related Group system in 200229,30 regarding payment to public hospitals may have resulted in more complete registration. However, it may also have affected coding practices for some diseases and certain types of treatments. Private hospitals and clinics are potential sources of underreporting.40 Although it has been mandatory for private health care providers to report all activities since 2003, and the Danish Health and Medicines Authority runs information campaigns to promote registration,38 registration from private hospitals and clinics remains incomplete.17,41 Private hospitals offer services paid by taxes due to the rules of “free hospital choice” or as part of an agreement with a region, as well as services paid privately either by insurance companies or private parties.21,40 Services paid for by private parties have the highest degree of incomplete registration. Nonrandomized studies are susceptible to confounding by known and unknown factors.209 Therefore – irrespective of data source – the potential for confounding always needs to be addressed in the study design or analysis. The DNPR provides an opportunity to obtain information on many potential confounders, particularly comorbidities.58,210 The possibility of identifying such covariables from patients’ history of hospital encounters (back to 1977) rather than short-fixed historical windows may also result in less biased estimates.211 Still, it should be kept in mind that incomplete registration of some diagnoses and missing data on other characteristics (eg, lifestyle risk factors212) may leave substantial residual and unmeasured confounding. As data in the DNPR currently span almost four past decades, the registry is a unique data source to monitor long-term temporal trends in use of diagnostic procedures (eg, cardiac CT angiography),164 treatments (eg, use of implantable cardioverter-defibrillators),213 and disease incidence (eg, myocardial infarction).27,170 Related particularly to disease incidence, however, a number of methodological problems must be considered. First, the DNPR only covers patients with disease episodes associated with hospital contact and thus not necessarily the total number of patients with a given disease (as described previously). Third, it may be difficult – or even impossible – to identify incident diagnoses of chronic diseases in older patients because of immigration or the lack of hospital data before 1977. Thus, events occurring prior to 1977 are left censored if individuals are enrolled in a study and left truncated if they are not.214 On the other hand, the DNPR enables reconstruction of individual life and health trajectories of persons born in 1977 or later. The DNPR is a valuable tool for epidemiological research, providing longitudinal registration of diagnoses, treatments, and examinations, with complete nationwide coverage since 1978. Denmark’s constellation of universal health care, routine and long-standing registration of life and health events, and the possibility of exact individual-level linkage impart virtually unlimited research possibilities onto the DNPR. At the same time, varying completeness and validity of the individual variables underscore the need for validation of its clinical data before using the registry for research. The study was approved by the Danish Data Protection Agency (record number 1-16-02-1-08). Author HTS was supported by the Program for Clinical Research Infrastructure (PROCRIN) established by the Lundbeck Foundation and the Novo Nordisk Foundation, and the Department of Clinical Epidemiology’s Research Foundation. The funding sources had no role in the design, conduct, analysis, or reporting of the study. MS conceived the study idea, designed the study, and wrote the initial draft. MS reviewed the literature on the registry content together with JLS; study examples together with HTS; and previous validation studies together with SAJS. HTS obtained data permissions and LP collected the data and carried out the descriptive analyses. All authors contributed to data analysis, drafting and critical revision of the paper, and agree to be accountable for all aspects of the work. Sørensen HT. Regional administrative health registries as a resource in clinical epidemiology: a study of options, strengths, limitations and data quality provided with examples of use. Int J Risk Saf Med. 1997;10(1):1–22. Sorensen HT, Sabroe S, Olsen J. A framework for evaluation of secondary data sources for epidemiological research. Int J Epidemiol. 1996;25(2):435–442. Benchimol EI, Smeeth L, Guttmann A, et al. The Reporting of studies Conducted using Observational Routinely-collected health Data (RECORD) Statement. PLoS Med. 2015;12(10):e1001885. PHARMO. The Dutch Hospital Database. Available from: http://www.pharmo.nl/pharmo-databases/hospitalisations-lmr. Accessed April 1, 2015. García-Rodríguez LA, Pérez Gutthann S. Use of the UK general practice research database for pharmacoepidemiology. Br J Clin Pharmacol. 1998;45(5):419–425. Lichtman JH, Leifheit-Limson EC, Goldstein LB. Centers for medicare and medicaid services medicare data and stroke research: goldmine or landmine? Stroke. 2015;46(2):598–604. Boyko EJ, Koepsell TD, Gaziano JM, Horner RD, Feussner JR. US department of veterans affairs medical care system as a resource to epidemiologists. Am J Epidemiol. 2000;151(3):307–314. Herrett E, Gallagher AM, Bhaskaran K, et al. Data resource profile: clinical practice research datalink (CPRD). Int J Epidemiol. 2015;44(3):827–836. National Cancer Institute. Pharmacoepidemiology and Healthcare Databases. Available from: http://epi.grants.cancer.gov/pharm/pharmacoepi_db/. Accessed June 24, 2015. Health Statistics for the Nordic Countries 2014. Nordic Medico-Statistical Committee; 2014:102. Olsen J, Basso O, Sørensen HT. What is a population-based registry? Scand J Public Health. 1999;27(1):78–78. Sund R. Quality of the Finnish hospital discharge register: a systematic review. Scand J Public Health. 2012;40(6):505–515. Ludvigsson JF, Andersson E, Ekbom A, et al. External review and validation of the Swedish national inpatient register. BMC Public Health. 2011;11(1):450. Gudbjornsson B, Thorsteinsson SB, Sigvaldason H, et al. Rofecoxib, but not celecoxib, increases the risk of thromboembolic cardiovascular events in young adults – a nationwide registry-based study. Eur J Clin Pharmacol. 2010;66(6):619–625. Helsedirektoratet. [Norsk pasientregister]. Available from: http://www.helsedirektoratet.no/kvalitet-planlegging/norsk-pasientregister-npr/innhold-og-kvalitet/Sider/default.aspx. Accessed April 1, 2015. Office of the Auditor General of Norway. [Revisjonsrapport om kvaliteten på de medisinske kodingene i helseforetakene som grunnlag for innsatsstyrt finansiering. I: Riksrevisjonens kontroll med forvaltningen av statlige selskaper for 2008]. Dokument 3: 2 (2009–2010), Vedlegg 5; Oslo:2009. Lynge E, Sandegaard JL, Rebolj M. The Danish national patient register. Scand J Public Health. 2011;39(7 Suppl):30–33. Andersen TF, Madsen M, Jorgensen J, Mellemkjoer L, Olsen JH. The Danish national hospital register. A valuable source of data for modern health sciences. Dan Med Bull. 1999;46(3):263–268. Nickelsen TN. 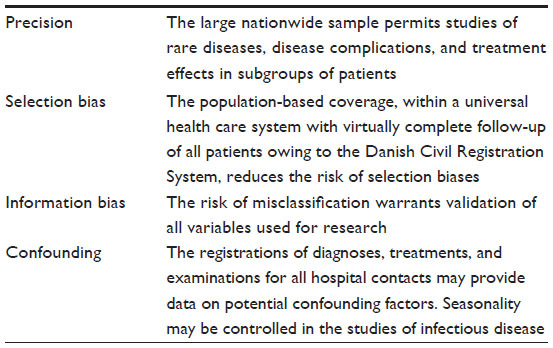 Data validity and coverage in the Danish National Health Registry. A literature review [in Danish: Datavaliditet og dækningsgrad i Landspatientregisteret. En litteraturgennemgang]. Ugeskr Laeger. 2002;164(1):33–37. Ministry of Interior and Health. Health Care in Denmark; 2008. Available from: http://tyskland.um.dk/de/~/media/Tyskland/German-site/Documents/Reise%20und%20Aufenthalt/Health%20Care%20in%20Denmark.pdf. Accessed October 8, 2015. Danish Health and Medicines Authority. 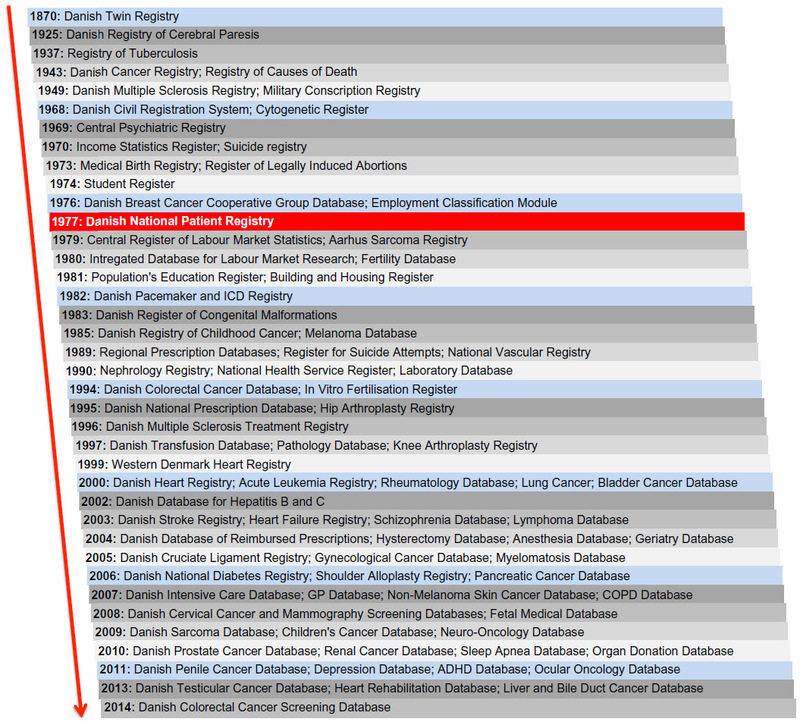 The Danish National Patient Registry Through 25 Years: 1977–2002; 2003. Copenhagen [Report no 21]. Danish Health and Medicines Authority. [Evaluation of the Danish National Patient Registry 1990]. Hospital Statistics II: 57; Copenhagen: 1993. Madsen KM, Schønheyder HC, Kristensen B, Nielsen GL, Sørensen HT. Can hospital discharge diagnosis be used for surveillance of bacteremia? A data quality study of a Danish hospital discharge registry. Infect Control Hosp Epidemiol. 1998;19(3):175–180. eSundhed. Documentation of the Danish National Patient Registry. Available from: http://www.esundhed.dk/dokumentation/Registre/Sider/Register.aspx#Pc980378f70f74dd890a9bdb3d00abd5a_2_340iT0. Accessed April 1, 2015. Department of Clinical Epidemiology, Aarhus University Hospital, Denmark. AUDEO – Program for Disease Epidemiology and Outcomes. Available from: http://www.audeo.dk/sygdomsmonitorering.aspx. Accessed April 1, 2015. Lidegaard ø, Vestergaard CH, Hammerum MS. Quality monitoring based on data from the Danish National Patient Registry. [in Danish: Kvalitetsmonitorering ud fra data i Landspatientregisteret]. Ugeskr Laeger. 2009;171(6):412–415. The Diagnosis Related Group (DRG) System. [Beretning om DRG-Systemet]. The National Audit Office of Denmark. Copenhagen: 2011. [in Danish]. The Diagnosis Related Group (DRG) system and the Danish Ambulant Grouping System (DAGS). Available from: http://www.drg.dk. Accessed April 1, 2015. Mors O, Perto GP, Mortensen PB. The Danish psychiatric central research register. Scand J Public Health. 2011;39(7 Suppl):54–57. Krebs L, Johansen AMT, Helweg-Larsen K. Indberetning af prokerede aborter i 1994: En sammenligning mellem data i registret over Legalt Provokerede Aborter og Landspatientregistret. Ugeskr Laeger. 1997; 159(11):1607–1611. Knudsen L, Olsen J. The Danish medical birth registry. Dan Med Bull. 1998;45(3):320–323. Danish Health and Medicines Authority. Changes in the reporting to the Danish National Patient Registry, 2000–2015 [in Danish: ændringer til indberetning til Landspatientregisteret]; 2015. Danish Health and Medicines Authority. Fællesindhold for basisregistrering af sygehuspatienter – Vejledningsdel [Common Content for Basic Registration of Hospital Patients 2014 – Instruction Part] 22nd ed; 2014. Copenhagen [Report no 6]. Danish. Danish Health and Medicines Authority. Common Content for Basic Registration of Hospital Patients 2014 – Technical Part (in Danish: Fællesindhold for basisregistrering af sygehuspatienter – Teknisk del). 23nd ed; 2013. Copenhagen [Report no 6]. Danish Health and Medicines Authority. Bekendtgørelse om lægers anmeldelse til Sundhedsstyrelsens Landspatientregister af patienter behandlet på private sygehuse eller klinikker; 2003. Copenhagen [Notification no 986]. Danish Health and Medicines Authority. Bekendtgørelse om lægers anmeldelse til Sundhedsstyrelsens Landspatientregister af patienter behandlet på private sygehuse eller klinikker; 2007. Copenhagen [Notification no 1073]. Danish Health and Medicines Authority. Private hospital activity 2006–2010 [In Danish: Aktivitet på private sygehuse 2006–2010]; 2011. Available from: http://sundhedsstyrelsen.dk/publ/Publ2011/DOKS/AktivitetPrivateSygehuse/AktvitetPrivateSygehuse2006-10.pdf. Accessed April 1, 2015. Politiken. Lack of control with private hospitals. [in Danish: Hul i kontrollen med privathospitaler]; 2008. Available from: http://pol.dk/565165. Accessed August 1, 2015. Personal Correspondence. Sundhedsdokumentation Sektor for National Sundhedsdokumentation og Forskning, Denmark. 2014:1–2. National Health IT. Sundhedsvæsenets Klassifikations System (SKS). Available from: http://www.ssi.dk/sks. Accessed October 1, 2015. National Health IT. SKS-Browser. Available from: http://www.medinfo.dk/sks/brows.php. Accessed April 1, 2015. The reference as indicated is correct (free access as guest user), thus with the updated date the please change the reference to: National Health IT. Historical SKS Codes. Available from: ftp://filer.sst.dk/filer/sks/data/skscomplete/. Accessed October 1, 2015. Centers for Disease Control and Prevention. International Classification of Diseases, Tenth Revision, Clinical Modification (ICD-10-CM). Available from: http://www.cdc.gov/nchs/icd/icd10cm.htm. Accessed April 1, 2015. Danish Health and Medicines Authority. Danish Classification of Surgical Procedures and Therapies. 1st, 2nd, 3rd ed. Copenhagen, Denmark: Danish Health and Medicines Authority; 1973, 1980, 1988. The Nordic Medico-Statistical Committee (NOMESCO) Classification of Surgical Procedures. Available from: http://nowbase.org/Publikationer/~/media/Projekt%20sites/Nowbase/Publikationer/NCSP/NCSP%201_14.ashx. Accessed April 1, 2015. Baron JA, Sørensen HT, Sox Jr HC. Clinical epidemiology. In: Olsen J, Saracci R, Trichopoulos D, editors. Teaching Epidemiology: A Guide for Teachers in Epidemiology, Public Health and Clinical Medicine. 4th ed., pp. 444–462. Oxford: Oxford University Press; 2015. Jürgensen HJ, Frølund C, Gustafsen J, Mosbech H, Guldhammer B, Mosbech J. 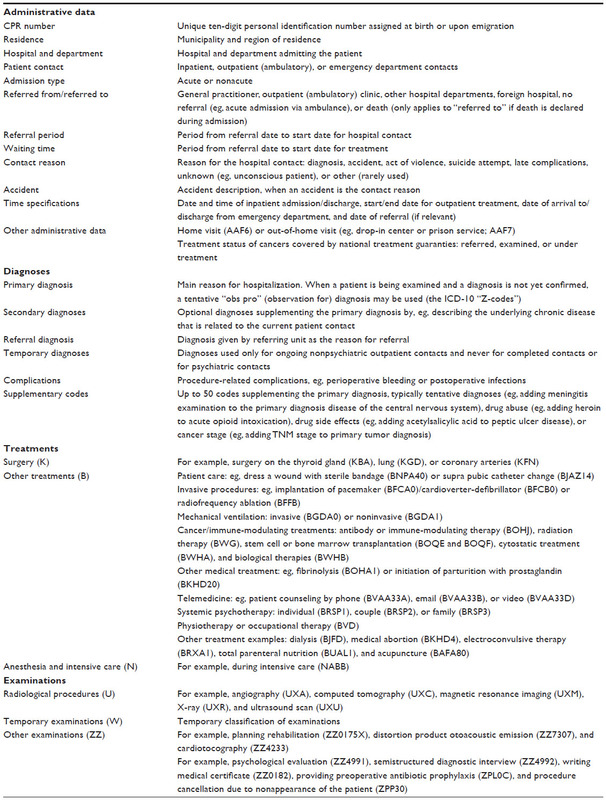 Registration of diagnoses in the Danish national registry of patients. Methods Inf Med. 1986;25(3):158–164. Division of Health Planning at C. F. Møller on behalf of The Danish National Board of Health. Project concerning data quality in The Danish National Patient Registry [in Danish: Projekt vedrørende datakvalitet i Landspatientregistret]. 2004. Vest-Hansen B, Riis AH, Christiansen CF. Registration of acute medical hospital admissions in the Danish national patient registry: a validation study. Clin Epidemiol. 2013;5:129–133. Holland-Bill L, Xu H, Sørensen HT, et al. Positive predictive value of primary inpatient discharge diagnoses of infection among cancer patients in the Danish national registry of patients. Ann Epidemiol. 2014;24(8):593–7, 597. e1–e18. Sørensen HT, Hansen I, Ejlersen E, Schønheyder HC, Hamburger H, Sabroe S. Identification of cases of meningococcal disease: data quality in two Danish population-based information systems during a 14-year period. Int J Risk Saf Med. 1995;7(3):179–189. Gradel KO, Nielsen SL, Pedersen C, et al; Danish Collaborative Bacteraemia Network (DACOBAN), Danish Observational Registry of Infectious Syndromes (DORIS). Low completeness of bacteraemia registration in the Danish national patient registry. PLoS One. 2015;10(6):e0131682. Søgaard KK, Thomsen RW, Schønheyder HC, Søgaard M. Positive predictive values of the international classification of diseases, 10th revision diagnoses of Gram-negative septicemia/sepsis and urosepsis for presence of Gram-negative bacteremia. Clin Epidemiol. 2015;7:195–199. Obel N, Reinholdt H, Omland LH, Engsig F, Sørensen HT, Hansen A-BE. Retrivability in the Danish national hospital registry of HIV and hepatitis B and C coinfection diagnoses of patients managed in HIV centers 1995–2004. BMC Med Res Methodol. 2008;8:25. Osterlind A, Jensen OM. Evaluation of cancer registration in Denmark in 1977. Preliminary evaluation of cancer registration by the Cancer Register and the National Patient Register [in Danish: Evaluering af cancerregistreringen i Danmark 1977. En praeliminaer evaluering af cancerregisterets og landspatientregisterets registrering af cancertilfaelde]. Ugeskr Laeger. 1985;147(31):2483–2488. Helqvist L, Erichsen R, Gammelager H, Johansen MB, Sørensen HT. Quality of ICD-10 colorectal cancer diagnosis codes in the Danish national registry of patients. Eur J Cancer Care (Engl). 2012;21(6):722–727. Lash TL, Riis AH, Ostenfeld EB, Erichsen R, Vyberg M, Thorlacius-Ussing O. A validated algorithm to ascertain colorectal cancer recurrence using registry resources in Denmark. Int J Cancer. 2015;136(9):2210–2215. Kjaergaard J, Clemmensen IH, Storm HH. Validity and completeness of registration of surgically treated malignant gynaecological diseases in the Danish national hospital registry. J Epidemiol Biostat. 2001;6(5):387–392. Drljevic A, Borre M, Ehrenstein V, Nguyen-nielsen M, Høyer M. Quality of venous thromboembolism diagnoses among prostate cancer patients in the Danish national registry of patients. Clin Epidemiol. 2014;6:351–357. Gammelager H, Christiansen CF, Johansen MB, Borre M, Schoonen M, Sørensen HT. Quality of urological cancer diagnoses in the Danish national registry of patients. Eur J Cancer Prev. 2012;21(6):545–551. Jensen Aø, Nørgaard M, Yong M, Fryzek JP, Sørensen HT. Validity of the recorded international classification of diseases, 10th edition diagnoses codes of bone metastases and skeletal-related events in breast and prostate cancer patients in the Danish national registry of patients. Clin Epidemiol. 2009;1:101–108. Ehrenstein V, Hernandez RK, Maegbaek ML, et al. Validation of algorithms to detect distant metastases in men with prostate cancer using routine registry data in Denmark. Clin Epidemiol. 2015;7:259–265. Nørgaard M, Skriver MV, Gregersen H, Pedersen G, Schønheyder HC, Sørensen HT. The data quality of haematological malignancy ICD-10 diagnoses in a population-based hospital discharge registry. Eur J Cancer Prev. 2005;14(3):201–206. Kjaergaard J, Clemmensen IH, Thomsen BL, Storm HH. Validity of diagnoses of and operations for nonmalignant gynecological conditions in the Danish national hospital registry. J Clin Epidemiol. 2002;55(2):137–142. Nielsen EH, Lindholm J, Laurberg P. Use of combined search criteria improved validity of rare disease (craniopharyngioma) diagnosis in a national registry. J Clin Epidemiol. 2011;64(10):1118–1126. Gregersen H, Larsen C, Haglund A, Mortensen R, Andersen NF, Nørgaard M. Data quality of the monoclonal gammopathy of undetermined significance diagnosis in a hospital registry. Clin Epidemiol. 2013;5:321–326. Andersen GS, Toftdahl D, Nielsen PE, Strandgaard S, Lund JO. Pheochromocytoma in Denmark 1977-1981 [in Danish: Faeokromocytom i Danmark 1977-1981]. Ugeskr Laeger. 1986;148(47):3109–3113. Zalfani J, Frøslev T, Olsen M, et al. Positive predictive value of the international classification of diseases, 10th edition diagnosis codes for anemia caused by bleeding in the Danish national registry of patients. Clin Epidemiol. 2012;4:327–331. Ben Ghezala I, Arendt JF, Erichsen R, et al. Positive predictive value of the diagnosis coding for vitamin B12 deficiency anemia in the Danish national patient register. Clin Epidemiol. 2012;4:333–338. Heden KEK, Jensen Aø, Farkas DK, Nørgaard M. Validity of a procedure to identify patients with chronic idiopathic thrombocytopenic purpura in the Danish national registry of patients. Clin Epidemiol. 2009;1:7–10. Kristensen JK, Drivsholm TB, Carstensen B, Steding-Jensen M, Green A. Validation of methods to identify known diabetes on the basis of health registers [in Danish: Validering af metoder til identifikation af erkendt diabetes på basis af administrative sundhedsregistre]. Ugeskr Laeger. 2007;169(18):1687–1692. Thomsen RW, Hundborg HH, Lervang H-H, Johnsen SP, Sørensen HT, Schønheyder HC. Diabetes and outcome of community-acquired pneumococcal bacteremia: a 10-year population-based cohort study. Diabetes Care. 2004;27(1):70–76. Atladóttir HO, Pedersen MG, Thorsen P, et al. Association of family history of autoimmune diseases and autism spectrum disorders. Pediatrics. 2009;124(2):687–694. Svensson J, Marinelli K, Eising S. Landspatientregisteret over for et specialespecifikt register for diabetes i barnealderen? Ugeskr Laeger. 2007;169(2):122. Nielsen GL, Sørensen HT, Pedersen AB, Sabroe S. Analyses of data quality in registries concerning diabetes mellitus – A comparison between a population based hospital discharge and an insulin prescription registry. J Med Syst. 1996;20(1):1–10. Dal J, Skou N, Nielsen EH, Pedersen L, Joergensen JOL. Acromegaly according to the Danish national registry of patients: how valid are ICD diagnoses and how do patterns of registration affect the accuracy of registry data? Clin Epidemiol. 2014;6:295–299. Lund JO, Andersen GS, Toftdahl D, Strandgaard S, Nielsen PE. Primary aldosteronism (Conn’s syndrome) in Denmark 1977-1981 [in Danish: Primaer aldosteronisme (Conn’s syndrom) i Danmark 1977-1981]. Ugeskr Laeger. 1986;148(47):3115–3118. Rasmussen NH, Thomsen RW, Rasmussen HH, Søgaard M. Validity of diagnostic coding for undernutrition in hospitals. Clin Nutr. 2015. Epub ahead of print. Holland-Bill L, Christiansen CF, Ulrichsen SP, Ring T, Jørgensen JOL, Sørensen HT. Validity of the international classification of diseases, 10th revision discharge diagnosis codes for hyponatraemia in the Danish national registry of patients. BMJ Open. 2014;4(4):e004956. Phung TKT, Andersen BB, Høgh P, Kessing LV, Mortensen PB, Waldemar G. Validity of dementia diagnoses in the Danish hospital registers. Dement Geriatr Cogn Disord. 2007;24(3):220–228. Kioumourtzoglou M-A, Seals RM, Himmerslev L, Gredal O, Hansen J, Weisskopf MG. Comparison of diagnoses of amyotrophic lateral sclerosis by use of death certificates and hospital discharge data in the Danish population. Amyotroph Lateral Scler Frontotemporal Degener. 2015;16(3–4):224–229. Wermuth L, Lassen CF, Himmerslev L, Olsen J, Ritz B. Validation of hospital register-based diagnosis of Parkinson’s disease. Dan Med J. 2012;59(3):A4391. Rugbjerg K, Ritz B, Korbo L, Martinussen N, Olsen JH. Risk of Parkinson’s disease after hospital contact for head injury: population based case-control study. BMJ. 2008;337:a2494. Greene N, Lassen CF, Rugbjerg K, Ritz B. Reproductive factors and Parkinson’s disease risk in Danish women. Eur J Neurol. 2014;21(9):1168–e68. Mason K, Thygesen LC, Stenager E, Brønnum-Hansen H, Koch-Henriksen N. Evaluating the use and limitations of the Danish national patient register in register-based research using an example of multiple sclerosis. Acta Neurol Scand. 2012;125(3):213–217. Christensen J, Vestergaard M, Olsen J, Sidenius P. Validation of epilepsy diagnoses in the Danish national hospital register. Epilepsy Res. 2007;75(2–3):162–170. Krarup L-H, Boysen G, Janjua H, Prescott E, Truelsen T. Validity of stroke diagnoses in a National register of patients. Neuroepidemiology. 2007;28(3):150–154. Johnsen SP, Overvad K, Sørensen HT, Tjønneland A, Husted SE. Predictive value of stroke and transient ischemic attack discharge diagnoses in the Danish national registry of patients. J Clin Epidemiol. 2002;55(6):602–607. Djurhuus BD, Skytthe A, Faber CE. Validation of the cholesteatoma diagnosis in the Danish national hospital register. Dan Med Bull. 2010;57(10):A4159. Schmidt M, Johannesdottir SA, Lemeshow S, et al. Obesity in young men, and individual and combined risks of type 2 diabetes, cardiovascular morbidity and death before 55 years of age: a Danish 33-year follow-up study. BMJ Open. 2013;3(4):e002698. Nielsen HW, Tüchsen F, Jensen MV. Validiteten af diagnosen essentiel hypertension i Landspatientregistret. Ugeskr Laeger. 1996;158(2):163–167. Joensen AM, Jensen MK, Overvad K, et al. Predictive values of acute coronary syndrome discharge diagnoses differed in the Danish national patient registry. J Clin Epidemiol. 2009;62(2):188–194. Coloma PM, Valkhoff VE, Mazzaglia G, et al; EU-ADR Consortium. Identification of acute myocardial infarction from electronic healthcare records using different disease coding systems: a validation study in three European countries. BMJ Open. 2013;3(6):e002862. Stratifed analyses of the positive predictive values were kindly provided by Albert Marni Joensen, Department of Cardiology, Aalborg University Hospital, Aalborg, Denmark; 2014. Madsen M, Davidsen M, Rasmussen S, Abildstrom SZ, Osler M. The validity of the diagnosis of acute myocardial infarction in routine statistics: a comparison of mortality and hospital discharge data with the Danish MONICA registry. J Clin Epidemiol. 2003;56(2):124–130. Madsen M, Balling H, Eriksen LS. The validity of the diagnosis of acute myocardial infarction in two registries: the Heart Registry compared to the National Patient Registry [in Danish: Validiteten af diagnosen akut myokardieinfarkt i to registre: Hjerteregistret sammenlignet med Landspatientregistret]. Ugeskr Laeger. 1990;152(5):308–314. Severinsen MT, Kristensen SR, Overvad K, Dethlefsen C, Tjønneland A, Johnsen SP. Venous thromboembolism discharge diagnoses in the Danish national patient registry should be used with caution. J Clin Epidemiol. 2010;63(2):223–228. Larsen TB, Johnsen SP, Møller CI, Larsen H, Sørensen HT. A review of medical records and discharge summary data found moderate to high predictive values of discharge diagnoses of venous thromboembolism during pregnancy and postpartum. J Clin Epidemiol. 2005;58(3):316–319. Ingeman A, Andersen G, Hundborg HH, Johnsen SP. Medical complications in patients with stroke: data validity in a stroke registry and a hospital discharge registry. Clin Epidemiol. 2010;2:5–13. Rix TA, Riahi S, Overvad K, Lundbye-Christensen S, Schmidt EB, Joensen AM. Validity of the diagnoses atrial fibrillation and atrial flutter in a Danish patient registry. Scand Cardiovasc J. 2012;46(3):149–153. Frost L, Andersen LV, Vestergaard P, Husted S, Mortensen LS. Trend in mortality after stroke with atrial fibrillation. Am J Med. 2007;120(1):47–53. Frost L, Vestergaard P. Alcohol and risk of atrial fibrillation or flutter: a cohort study. Arch Intern Med. 2004;164(18):1993–1998. Mard S, Nielsen FE. Positive predictive value and impact of misdiagnosis of a heart failure diagnosis in administrative registers among patients admitted to a university hospital cardiac care unit. Clin Epidemiol. 2010;2:235–239. Kümler T, Gislason GH, Kirk V, et al. Accuracy of a heart failure diagnosis in administrative registers. Eur J Heart Fail. 2008;10(7):658–660. Wildenschild C, Mehnert F, Thomsen RW, et al. Registration of acute stroke: validity in the Danish stroke registry and the Danish national registry of patients. Clin Epidemiol. 2013;6:27–36. Gaist D, Vaeth M, Tsiropoulos I, et al. Risk of subarachnoid haemorrhage in first degree relatives of patients with subarachnoid haemorrhage: follow up study based on national registries in Denmark. BMJ. 2000;320(7228):141–145. Tuckuviene R, Kristensen SR, Helgestad J, Christensen AL, Johnsen SP. Predictive value of pediatric thrombosis diagnoses in the Danish national patient registry. Clin Epidemiol. 2010;2:107–122. Schmidt M, Cannegieter SC, Johannesdottir SA, Dekkers OM, Horvath-Puho E, Sørensen HT. Statin use and venous thromboembolism recurrence: a combined nationwide cohort and nested case-control study. J Thromb Haemost. 2014;12(8):1207–1215. Lidegaard ø, Nielsen LH, Skovlund CW, Skjeldestad FE, Løkkegaard E. Risk of venous thromboembolism from use of oral contraceptives containing different progestogens and oestrogen doses: Danish cohort study, 2001–9. BMJ. 2011;343:d6423–d6423. Stensballe LG, Kristensen K, Nielsen J, Aaby P. Diagnosis coding in the Danish national patient registry for respiratory syncytial virus infections. Scand J Infect Dis. 2005;37(10):747–752. Thomsen RW, Lange P, Hellquist B, et al. Validity and underrecording of diagnosis of COPD in the Danish national patient registry. Respir Med. 2011;105(7):1063–1068. Jensen Aø, Nielsen GL, Ehrenstein V. Validity of asthma diagnoses in the Danish national registry of patients, including an assessment of impact of misclassification on risk estimates in an actual dataset. Clin Epidemiol. 2010;2:67–72. Moth G, Vedsted P, Schiøtz PO. National registry diagnoses agree with medical records on hospitalized asthmatic children. Acta Paediatr. 2007;96(10):1470–1473. Søgaard M, Kornum JB, Schønheyder HC, Thomsen RW. Positive predictive value of the ICD-10 hospital diagnosis of pleural empyema in the Danish national registry of patients. Clin Epidemiol. 2011;3: 85–89. Lassen A, Hallas J, de Muckadell OBS. Complicated and uncomplicated peptic ulcers in a Danish county 1993–2002: a population-based cohort study. Am J Gastroenterol. 2006;101(5):945–953. Fonager K, Sørensen HT, Rasmussen SN, Møller-Petersen J, Vyberg M. Assessment of the diagnoses of Crohn’s disease and ulcerative colitis in a Danish hospital information system. Scand J Gastroenterol. 1996;31(2):154–159. Vestberg K, Thulstrup AM, Sørensen HT, Ottesen P, Sabroe S, Vilstrup H. Data quality of administratively collected hospital discharge data for liver cirrhosis epidemiology. J Med Syst. 1997;21(1):11–20. Jepsen P, Vilstrup H, Sørensen HT. Alcoholic cirrhosis in Denmark – population-based incidence, prevalence, and hospitalization rates between 1988 and 2005: a descriptive cohort study. BMC Gastroenterol. 2008;8(1):3. Erichsen R, Strate L, Sørensen HT, Baron JA. Positive predictive values of the international classification of disease, 10th edition diagnoses codes for diverticular disease in the Danish national registry of patients. Clin Exp Gastroenterol. 2010;3:139–142. Floyd A, Pedersen L, Nielsen GL, Thorladcius-Ussing O, Sørensen HT. Secular trends in incidence and 30-day case fatality of acute pancreatitis in North Jutland County, Denmark: a register-based study from 1981–2000. Scand J Gastroenterol. 2002;37(12):1461–1465. Majholm B, Bartholdy J, Christoffersen JK, Engbæk J, Møller AM. Poor agreement between data from the National patient registry and the Danish patient insurance association. Dan Med J. 2012;59(6):A4430. Pedersen M, Klarlund M, Jacobsen S, Svendsen AJ, Frisch M. Validity of rheumatoid arthritis diagnoses in the Danish national patient registry. Eur J Epidemiol. 2004;19(12):1097–1103. Friis S, Mellemkjaer L, McLaughlin JK, et al. Connective tissue disease and other rheumatic conditions following breast implants in Denmark. Ann Plast Surg. 1997;39(1):1–8. Jensen MV, Tüchsen F. Erhverv og diskusprolaps i lænden [Lumbar disc prolapse]. Ugeskr Laeger. 1995;157(11):1519–1523. Danish. Gammelager H, Sværke C, Noerholt SE, et al. Validity of an algorithm to identify osteonecrosis of the jaw in women with postmenopausal osteoporosis in the Danish national registry of patients. Clin Epidemiol. 2013;5:263–267. Gammelager H, Erichsen R, Antonsen S, et al. Positive predictive value of the international classification of diseases, 10th revision, codes to identify osteonecrosis of the jaw in patients with cancer. Cancer Epidemiol. 2012;36(4):381–383. Ehrenstein V, Gammelager H, Schiødt M, et al. Evaluation of an ICD-10 algorithm to detect osteonecrosis of the jaw among cancer patients in the Danish national registry of patients. Pharmacoepidemiol Drug Saf. 2015;24(7):693–700. Schmidt L, Damsgaard MT, Nielsen JM. An evaluation of the national patient register. A study of validity of some abortion diagnoses. Ugeskr Laeger. 1989;151(51):3478–3482. Lohse SR, Farkas DK, Lohse N, et al. Validation of spontaneous abortion diagnoses in the Danish national registry of patients. Clin Epidemiol. 2010;2:247–250. Klemmensen åK, Olsen SF, østerdal ML, Tabor A. Validity of preeclampsia-related diagnoses recorded in a national hospital registry and in a postpartum interview of the women. Am J Epidemiol. 2007; 166(2):117–124. Kristensen J, Langhoff-Roos J, Skovgaard LT, Kristensen FB. Validation of the Danish birth registration. J Clin Epidemiol. 1996; 49(8):893–897. Langhoff-Roos J, Rasmussen S. Danish Health and Medicines Authority. [Validering af Landspatientregistret (LPR) mhp. obstetrisk forskning og kvalitetssikring]; Copenhagen: 2003. Devantier A, Kjer JJ. The national patient register – a research tool? [in Danish: Landspatientregistret – et forskningsredskab?]. Ugeskr Laeger. 1991;153(7):516–517. Thygesen SK, Olsen M, Christiansen C. Positive predictive value of the infant respiratory distress syndrome diagnosis in the Danish national patient registry. Clin Epidemiol. 2013;5:295–298. Maimburg RD, Bech BH, Bjerre JV, Olsen J, Møller-Madsen B. Obstetric outcome in Danish children with a validated diagnosis of kernicterus. Acta Obstet Gynecol Scand. 2009;88(9):1011–1016. Agergaard P, Hebert A, Bjerre J, Sørensen KM, Olesen C, Ostergaard JR. Children diagnosed with congenital cardiac malformations at the national university departments of pediatric cardiology: positive predictive values of data in the Danish national patient registry. Clin Epidemiol. 2011;3:61–66. Jepsen B, Jepsen P, Johnsen SP, Espersen GT, Sørensen HT. Validity of diagnoses of cardiac malformations in a Danish population-based hospital-discharge registry. Int J Risk Saf Med. 2006;18(2):77–81. Larsen H, Nielsen GL, Bendsen J, Flint C, Olsen J, Sørensen HT. Predictive value and completeness of the registration of congenital abnormalities in three Danish population-based registries. Scand J Public Health. 2003;31(1):12–16. Jensen MS, Snerum TM, Olsen LH, et al. Accuracy of cryptorchidism diagnoses and corrective surgical treatment registration in the Danish national patient registry. J Urol. 2012;188(4):1324–1329. Pedersen L, Skriver MV, Nørgaard M, Sørensen HT. Maternal use of loratadine during pregnancy and risk of hypospadias in offspring. Int J Med Sci. 2006;3(1):21–25. Gravholt CH, Juul S, Naeraa RW, Hansen J. Morbidity in Turner syndrome. J Clin Epidemiol. 1998;51(2):147–158. Vestergaard M, Obel C, Henriksen TB. The Danish national hospital register is a valuable study base for epidemiologic research in febrile seizures. J Clin Epidemiol. 2006;59(1):61–66. Lauridsen MD, Gammelager H, Schmidt M, Nielsen H, Christiansen CF. Positive predictive value of international classification of diseases, 10(th) revision, diagnosis codes for cardiogenic, hypovolemic, and septic shock in the Danish national patient registry. BMC Med Res Methodol. 2015;15(1):23. Sørensen HT, Nielsen JO, Nissen I, Nielsen J. Head injuries. I. An epidemiological study based on 596 patients over a 4-year period [in Danish: Kranietraumer. I. En epidemiologisk undersøgelse baseret på 596 patienter i en 4 års periode]. Ugeskr Laeger. 1987;149(10):680–683. Hougaard K, Kjaersgaard-Andersen P, Kuur E. Registration under the diagnosis of traumatic hip luxation in the national registry [in Danish: Landspatientregisterets registrering under diagnosen traumatisk hofteluksation]. Ugeskr Laeger. 1992;154(40):2747–2748. Sørensen HT, Nielsen B, Ostergaard Nielsen J. Anaphylactic shock occurring outside hospitals. Allergy. 1989;44(4):288–290. Lange J, Pedersen AB, Troelsen A. Do hip prosthesis related infection codes in administrative discharge registers correctly classify periprosthetic hip joint infection? Hip Int. 2015. Epub ahead of print. McLaughlin JK, Olsen JH, Friis S, Mellemkjaer L, Fraumeni JF. Re: breast implants, cancer, and systemic sclerosis. J Natl Cancer Inst. 1995;87(18):1415–1416. Holte K, Bay-Nielsen M, Utzon J, Støckel M, Funch-Jensen P, Kehlet H. Operation for gastroøsofageal refluks i Danmark 1997–1999. Ugeskr Laeger. 2001;163(41):5658–5661. Harboe KM, Anthonsen K, Bardram L. Validation of data and indicators in the Danish cholecystectomy database. Int J Qual Health Care. 2009;21(3):160–168. Jespersen CG, Borre M, Nørgaard M. Validity of the recorded codes of gonadotropin-releasing hormone agonist treatment and orchiectomies in the Danish national patient registry. Clin Epidemiol. 2012;4: 145–149. Møller C, Kehlet H, Utzon J, Ottesen BS. Hysterectomy in Denmark. An analysis of postoperative hospitalisation, morbidity and readmission. Ugeskr Laeger. 2002;164(39):4539. Ottesen M. Validity of the registration and reporting of vaginal prolapse surgery [in Danish: Validitet af kodning og indberetning ved vaginal prolapskirurgi]. Ugeskr Laeger. 2009;171(6):404–408. Lass P, Lilholt J, Thomsen L, Lundbye-Christensen S, Enevoldsen H, Simonsen OH. The quality of diagnosis and procedure coding in Orthopaedic surgery Northern Jutland [in Danish: Kvaliteten af diagnose- og procedurekodning i Ortopaedkirurgi Nordjylland]. Ugeskr Laeger. 2006;168(48):4212–4215. Andersen LV, Mortensen LS, Lindholt JS, Faergeman O, Henneberg EW, Frost L. Completeness and positive predictive value of registration of upper limb embolectomy in the Danish national vascular registry. Clin Epidemiol. 2009;1:27–32. Blichert-Hansen L, Nielsson MS, Nielsen RB, Christiansen CF, Nørgaard M. Validity of the coding for intensive care admission, mechanical ventilation, and acute dialysis in the Danish national patient registry: a short report. Clin Epidemiol. 2013;5:9–12. Lund JL, Frøslev T, Deleuran T, et al. Validity of the Danish national registry of patients for chemotherapy reporting among colorectal cancer patients is high. Clin Epidemiol. 2013;5:327–334. Nielsson MS, Erichsen R, Frøslev T, Taylor A, Acquavella J, Ehrenstein V. Positive predictive values of the coding for bisphosphonate therapy among cancer patients in the Danish national patient registry. Clin Epidemiol. 2012;4:233–236. Haerskjold A, Henriksen L, Way S, et al. The Danish national prescription registry in studies of a biological pharmaceutical: palivizumab &ndash; validation against two external data sources. Clin Epidemiol. 2015;7:305–312. Nielsen LH, Nørgaard BL, Tilsted HH, et al. The Western Denmark cardiac computed tomography registry: a review and validation study. Clin Epidemiol. 2015;7:53–64. Brown LD, Cai TT, DasGupta A. Interval estimation for a binomial proportion. Stat Sci. 2001;16:101–117. Grann AF, Erichsen R, Nielsen AG, Frøslev T, Thomsen RW. Existing data sources for clinical epidemiology: the clinical laboratory information system (LABKA) research database at Aarhus university, Denmark. Clin Epidemiol. 2011;3:133–138. Kildemoes HW, Sørensen H, Hallas J. The Danish national prescription registry. Scand J Public Health. 2011;39(7 Suppl):38–41. Christiansen C, Johansen M, Christensen S, O’Brien JM, Tønnesen E, Sørensen H. Preadmission metformin use and mortality among intensive care patients with diabetes: a cohort study. Crit Care. 2013; 17(5):R192. Sørensen HT, Mellemkjær L, Steffensen FH, Olsen JH, Nielsen GL. The risk of a diagnosis of cancer after primary deep venous thrombosis or pulmonary embolism. N Engl J Med. 1998;338(17):1169–1173. Roos NP, Wennberg JE, Malenka DJ, et al. Mortality and reoperation after open and transurethral resection of the prostate for benign prostatic hyperplasia. N Engl J Med. 1989;320(17):1120–1124. Frost L, Vukelic Andersen L, Mortensen LS, Dethlefsen C. Seasonal variation in stroke and stroke-associated mortality in patients with a hospital diagnosis of nonvalvular atrial fibrillation or flutter. A population-based study in Denmark. Neuroepidemiology. 2006; 26(4):220–225. Schmidt M, Bøtker HE, Pedersen L, Sørensen HT. Comparison of the frequency of atrial fibrillation in young obese versus young nonobese men undergoing examination for fitness for military service. Am J Cardiol. 2014;113(5):822–826. Christensen AI, Ekholm O, Glümer C, et al. The Danish national health survey 2010. Study design and respondent characteristics. Scand J Public Health. 2012;40(4):391–397. Center for Public Health and Quality Improvement, Central Denmark Region. How Are You? Available from: http://www.cfk.rm.dk/om-cfk/projektsite/hvordan-har-du-det/om-undersogelsen/. Accessed October 1, 2015. Tjønneland A, Olsen A, Boll K, et al. Study design, exposure variables, and socioeconomic determinants of participation in diet, cancer and health: a population-based prospective cohort study of 57,053 men and women in Denmark. Scand J Public Health. 2007;35(4):432–441. Mikkelsen EM, Hatch EE, Wise LA, Rothman KJ, Riis A, Sørensen HT. Cohort profile: the Danish web-based pregnancy planning study – ‘Snart-Gravid’. Int J Epidemiol. 2009;38(4):938–943. Osler M, Linneberg A, Glümer C, Jørgensen T. The cohorts at the research centre for prevention and health, formerly ‘the Glostrup population studies’. Int J Epidemiol. 2011;40(3):602–610. Schnohr P, Jensen G, Lange P, Scharling H. The Copenhagen city heart study. østerbroundersøgelsen: tables with data from the third examination 1991–1994. Eur Heart J Suppl. 2001;3:(suppl H) H1-H83. Hjertholm P, Fenger-Grøn M, Vestergaard M, et al. Variation in general practice prostate-specific antigen testing and prostate cancer outcomes: an ecological study. Int J Cancer. 2015;136(2):435–442. Christiansen EH, Jensen LO, Thayssen P, et al; Scandinavian Organization for Randomized Trials with Clinical Outcome (SORT OUT) V investigators. Biolimus-eluting biodegradable polymer-coated stent versus durable polymer-coated sirolimus-eluting stent in unselected patients receiving percutaneous coronary intervention (SORT OUT V): a randomised non-inferiority trial. Lancet. 2013;381(9867):661–669. Thuesen L, Jensen LO, Tilsted HH, et al. Event detection using population-based health care databases in randomized clinical trials: a novel research tool in interventional cardiology. Clin Epidemiol. 2013;5:357–361. Sloth AD, Schmidt MR, Munk K, et al; CONDI Investigators. Improved long-term clinical outcomes in patients with ST-elevation myocardial infarction undergoing remote ischaemic conditioning as an adjunct to primary percutaneous coronary intervention. Eur Heart J. 2014;35(3):168–175. Nielsen PH, Maeng M, Busk M, et al; DANAMI-2 Investigators. Primary angioplasty versus fibrinolysis in acute myocardial infarction: long-term follow-up in the Danish acute myocardial infarction 2 trial. Circulation. 2010;121(13):1484–1491. Jespersen CM, Als-Nielsen B, Damgaard M, et al; CLARICOR Trial Group. Randomised placebo controlled multicentre trial to assess short term clarithromycin for patients with stable coronary heart disease: CLARICOR trial. BMJ. 2006;332(7532):22–27. Pedersen AT, Lidegaard ø, Kreiner S, Ottesen B. Hormone replacement therapy and risk of non-fatal stroke. Lancet. 1997;350(9087):1277–1283. Andersen BS, Olsen J. Oral contraception and factor V Leiden mutation in relation to localization of deep vein thrombosis. Thromb Res. 1998;90(4):191–194. Vest-Hansen B, Riis AH, Sørensen HT, Christiansen CF. Out-of-hours and weekend admissions to Danish medical departments: admission rates and 30-day mortality for 20 common medical conditions. BMJ Open. 2015;5(3):e006731–e006731. Thygesen LC, Ersbøll AK, editors. Danish population-based registers for public health and health-related welfare research. Scand J Public Health. 2011;39(7 Suppl):8–10. Andersen JS, Olivarius NDF, Krasnik A. The Danish national health service register. Scand J Public Health. 2011;39(7 Suppl):34–37. Statistics Denmark. The Integrated Database for Labour Market Researc. [In Danish: Den Integrerede Database for Arbejdsmarkedsforskning]; 2013:1–6. Available from: http://www.dst.dk/da/Statistik/Publikationer/VisPub.aspx?cid=20698. Accessed April 1, 2015. Christensen G. The building and housing register. Scand J Public Health. 2011;39(7 Suppl):106–108. Johannesdottir SA, Horvath-Puho E, Ehrenstein V, Schmidt M, Pedersen L, Sørensen HT. Existing data sources for clinical epidemiology: the Danish national database of reimbursed prescriptions. Clin Epidemiol. 2012;4:303–313. Helweg-Larsen K. The Danish register of causes of death. Scand J Public Health. 2011;39(7 Suppl):26–29. Harvald B, Hauge G, Kyvik KO, Christensen K, Skytthe A, Holm NV. The Danish twin registry: past and present. Twin Res. 2004;7(4):318–335. Databasernes fællessekretariat. Information on the Danish Clinical Registries. Available from: http://www.rkkp.dk/in-english/. Accessed August 1, 2015. The Danish e-Health Portal. Description of all Danish Clinical Registries (in Danish). Available from: http://www.sundhed.dk/sundhedsfaglig/kvalitet/kliniske-kvalitetsdatabaser/. Accessed August 1, 2015. Nørgaard M, Jensen Aø, Engebjerg MC, et al. Long-term clinical outcomes of patients with primary chronic immune thrombocytopenia: a Danish population-based cohort study. Blood. 2011;117(13):3514–3520. Anderson IB, Sørensen TI, Prener A. Increase in incidence of disease due to diagnostic drift: primary liver cancer in Denmark, 1943–1985. BMJ. 1991;302(6774):437–440. Schmidt M, Hováth-Puhó E, Christiansen CF, Petersen KL, Bøtker HE, Sørensen HT. Preadmission use of nonaspirin nonsteroidal anti-inflammatory drugs and 30-day stroke mortality. Neurology. 2014; 83(22):2013–2022. Topp M, Langhoff-Roos J, Uldall P. Validation of a cerebral palsy register. J Clin Epidemiol. 1997;50(9):1017–1023. Andersen TF, Madsen M, Loft A. Validity of surgical information from the Danish National Patient Registry with special attention to the analysis of regional variations in hysterectomy rates [in Danish: Regionale variationer i anvendelse af hysterektomi]. Ugeskr Laeger. 1987;149(36):2420–2422. 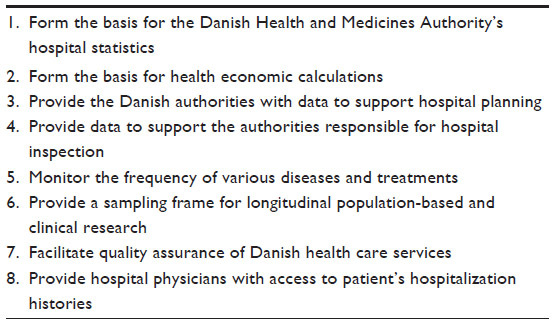 Green A. Danish clinical databases: an overview. Scand J Public Health. 2011;39(7 Suppl):68–71. Ingeholm P. Danish National Colorectal Cancer Database. National Database for Colorectal Cancer. Annual Report 2011; 2012. Petersen KE, Johnsen NF, Olsen A, et al. The combined impact of adherence to five lifestyle factors on all-cause, cancer and cardiovascular mortality: a prospective cohort study among Danish men and women. Br J Nutr. 2015;113(5):849–858. Brunelli SM, Gagne JJ, Huybrechts KF, et al. Estimation using all available covariate information versus a fixed look-back window for dichotomous covariates. Pharmacoepidemiol Drug Saf. 2013;22(5):542–550. Lidegaard ø, Løkkegaard E, Jensen A, Skovlund CW, Keiding N. Thrombotic stroke and myocardial infarction with hormonal contraception. N Engl J Med. 2012;366(24):2257–2266. Schmidt M, Pedersen SB, Farkas DK, et al. Thirteen-year nationwide trends in use of implantable cardioverter-defibrillators and subsequent long-term survival. Heart Rhythm. 2015;12(9):2018–2027. Cain KC, Harlow SD, Little RJ, et al. Bias due to left truncation and left censoring in longitudinal studies of developmental and disease processes. Am J Epidemiol. 2011;173(9):1078–1084. Alpert JS, Thygesen K, Antman E, Bassand JP. Myocardial infarction redefined – a consensus document of The Joint European Society of Cardiology/American College of Cardiology Committee for the redefinition of myocardial infarction. J Am Coll Cardiol. 2000;36(3):959–969. Danish Data Protection Agency. The Danish Act on Processing of Personal Data. Available from: http://www.datatilsynet.dk/english/the-danish-data-protection-agency/introduction-to-the-danish-data-protection-agency/. Accessed February 1, 2015. Danish Health and Medicines Authority. Forskerservice. Available from: http://www.ssi.dk/Sundhedsdataogit/Forskerservice.aspx. Accessed April 1, 2015. Danish Health and Medicines Authority. [Videregivelse af patientjournaloplysninger]. Available from: http://sundhedsstyrelsen.dk/da/sundhed/behandling-og-rettigheder/patientjournaloplysninger. Accessed April 1, 2015. Figure S1 Flowchart for the systematic review of validation studies. 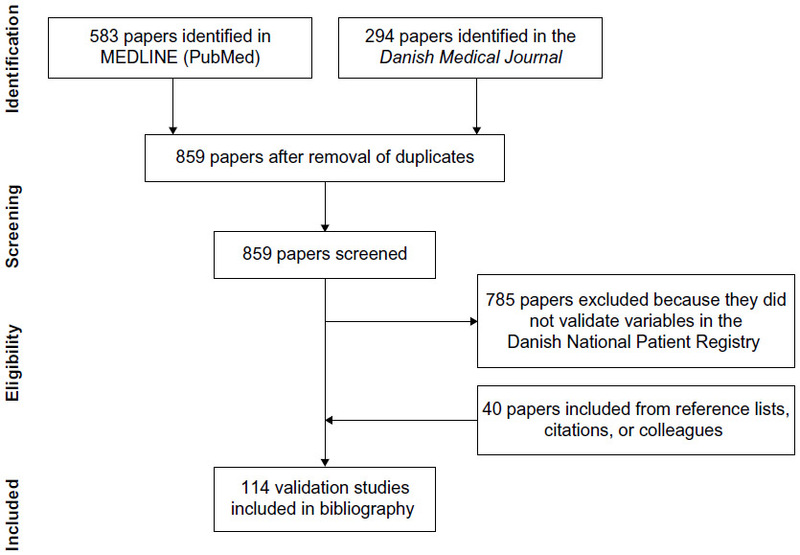 Notes: The literature search was performed on July 20, 2015 using the following search string in 1) PubMed: “Danish National Patient Registry” OR “Danish National Registry of Patients” OR “Danish National Hospital Register” OR “Danish National Health Registry” OR “Danish National Patient Register” OR “Danish Hospital Discharge Registry” OR “Danish National Hospital Registry” OR “Danish Hospital Registers”; and 2) the Danish Medical Journal: “Landspatientregisteret”. Notes: aThe ordering corresponds to the SKS browser, ie, ICD-10 for diagnoses and NOMESCO for surgery; bICD codes without and with capital letters refer to ICD-8 and ICD-10 codes, respectively; creflects the reviewed number of records in the DNPR (ie, the denominator in calculations of PPV). Among obstetric variables, we included only validation results based on >20 diagnoses; dconfidence intervals were calculated using Wilson’s score method; einformation not specified in validation papers, but confirmed through correspondence with authors. Unspecified and unconfirmed data are listed as not available (n/a); frecalculation of confidence intervals using Wilson’s score method not possible due to insufficient data; gconfidence limit equals 100 due to rounding. Abbreviations: A, primary diagnosis; AC, anticoagulant therapy; B, secondary diagnosis; COPD, chronic obstructive pulmonary disease; CT, computed tomography; d, day; DVT, deep venous thrombosis; DANMONICA, Danish Monitoring Trends and Determinants in Cardiovascular Disease project; DCR, Danish Cancer Registry; DNPR, Danish National Patient Registry; DS, discharge summaries; echo, echocardiography; ECG, electrocardiography; ED, emergency department; GP, general practitioner; HBV, hepatitis B virus; HCV, hepatitis C virus; HIV, human immunodeficiency virus; ICD, International Classification of Diseases; ICU, intensive care unit; IN, inpatient contact; LABKA, Clinical Laboratory Information System Database; mo, month; MR, medical records; MRI, magnetic resonance imaging; MS, multiple sclerosis; n/a, not available; NPV, negative predictive value; OUT, outpatient contact; PD, Pathology Registry; PE, pulmonary embolism; PPV, positive predictive value; PR, Prescription Registry; PSA, prostate specific antigen; Se, study sample sensitivity; Sp, study sample specificity; ultrasound, ultrasonography; y, year(s); V-P, ventilation-perfusion; VTE, venous thromboembolism; NOMESCO, Nordic Medico-Statistical Committee; wks, weeks.